. إن الخدمات الممتازة وحسن الضيافة العالي في Marina Hotel and Apartments تجعل إقامتك تجربة لا تنسى. يمكن الاستمتاع بمجموعة من الخدمات على أعلى المستويات في الفندق كمثل واي فاي مجاني في جميع الغرف, خدمة غسيل ذاتية, مرافق مخصصة لذوي الاحتياجات الخاصة, تسجيل وصول/خروج سريع, تخزين الأمتعة. يمكن للنزلاء الاختيار من ضمن مجموعة من الغرف المصممة بعناية لتعكس جواً من الراحة، والتي يتجاوز عددها 25. كما أن مجموعة الخدمات الواسعة الموجودة في الفندق لضمان راحتك تترك لك الكثير من الخيارات لقضاء وقتك أثناء فترة إقامتك. استمتع بخدمات لا يعلى عليها وعنوان ذو اعتبار في Marina Hotel and Apartments . Convenient and the suites were spacious and staff really friendly. We were in Port Lincoln for the weekend and so the 3 bed apartment was perfect for what we needed. It was also a great location for the Calypso shark diving and my family could just walk across the road which was great for such an early start. Clean, modern, simple accomodation. No complaints and would recommend. Don’t empty the bin in the room during house keeping. And makes the room smell like rubbish. Thank you for your feedback. We're sorry you experienced this problem and we will work hard to fix this in the future. We stayed in a suite and the apartment was good. We had dinner in the restaurant and the service and food were also very good. Our problem was with the card key. After I checked in we drove our car over to the apartment block and unloaded our luggage and carried it around to the building entry but the key would not unlock the entry door. My daughter waited with our belongings in the very cold wind while I rushed back to get a new key. The staff gave me two keys in case we had more trouble which was just as well because we tried both keys to open our apartment door and only one of them worked. We have had trouble with this type of key in other places as well so in future I will always ask for two keys just in case. This is a high quality establishment at good prices, but let down only by the "International Roast" coffee, which we all know is the cheapest and the worst coffee on the market. Please replace it with (at least) Moccona. This penny-pinching act detracted from the otherwise high professionalism and quality off the establishment. From the Bus ride from the airport until we Flew home our trip was great. The marina hotel truly understood how to deliver great customer service. Everyone was genuine no fake smiles or pleasantries here. I will definitely be back. The set up really suited us, 3 bedroom + 2 bathrooms. It is really close to the swimming pool. It was great to have our own personal laundry inside the apartment. The room it self had everything that we needed for our stay. But it was a bit disconcerting that we were able to hear conversations from our neighbours through the air vents. The noise in the hallways was really loud and with the hope of a sleep in (as it was the one night all year away from our kids) we were awoken by doors opening and closing and people talking. Our view was of the car park...so really not a great spot for a special occasion like our 10th wedding anniversary. Excellent. We enjoyed the marina environment and views. Great location to board for Great White Shark Cage Dive experience. Very pleasant stay but disappointed that a toaster wasn't allowed due to fire safety system and TV was unbelievably small. The apartments are lovely townhouses that you could easily live in. The Standard Waterfront Apartment in which we stayed is great value, being 6-berth and boasting excellent views of the marina. 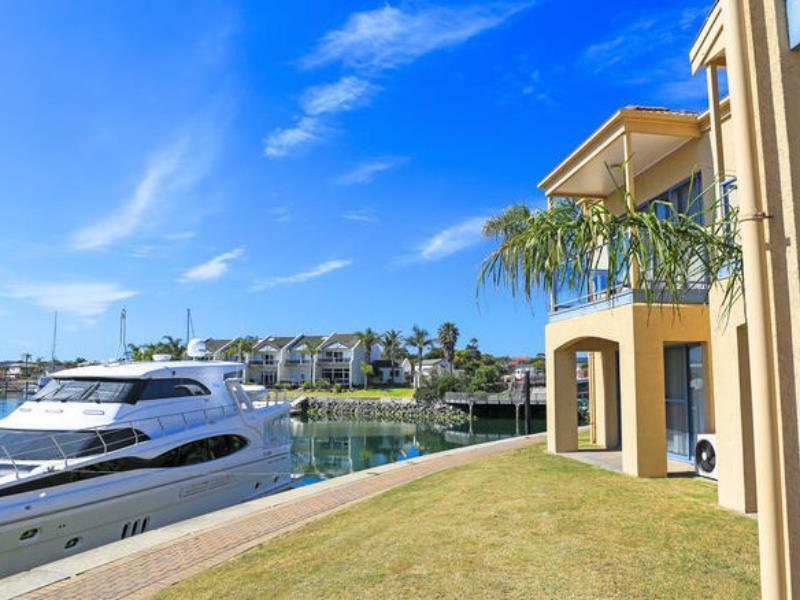 A great place to stay if you are diving with the sharks in Port Lincoln as the boats leave from the Marina Hotel jetty. Otherwise the location is a bit out of town so may not be suitable if you don't have a car. 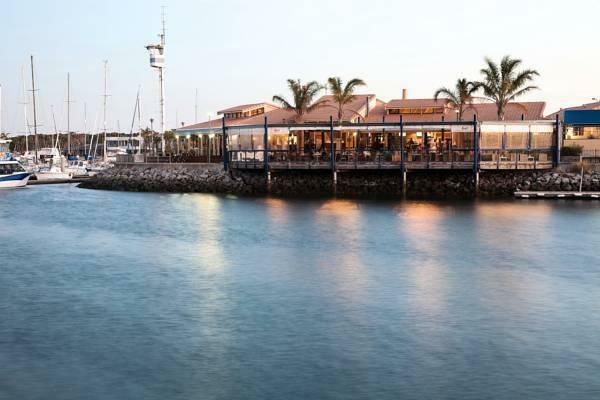 The restaurant here is a lovely deck area set right on the Marina, but it is a popular place for people to eat from all over Port Lincoln and as such it can be best to make a booking on Friday and Saturday nights. There are some other lovely restaurants in Port Lincoln town though - check out Tasman Terrace for great pubs, Italian and Asian restaurants. Otherwise buy some fresh seafood (try The Fresh Fish Place, just around the corner at 20 Proper Bay Rd) and cook it in your apartment's big, fully equipped kitchen. My stay was very pleasant with good areas around the hotel for walking and taking in the views.